The latest incarnation of the Surface Pro is, as I already said, an evolution of the Surface Pro 3. It keeps the same 3:2 aspect ratio on the display, which is now standard across the Surface line. The chassis is still built out of magnesium and finished with the same texture and color. The Surface Pro 3 went from a multi-position kickstand to an infinitely variable design, and worked well, so there was little reason to change that. In fact, the Surface kickstand is one of its defining features, but Microsoft did not even mention it during the October 6th devices event. I guess they feel it’s where it needs to be. When Anand reviewed the Surface Pro 3, one of the key features was how much thinner it was than the Surface Pro 2, yet it kept the same 15 Watt U series Haswell processor. This was an Ultrabook class processor, stuffed into a tablet. At just 9.1 mm thick, the Surface Pro 3 was quite a bit thinner than anything else out there with a full 15W Core CPU inside. The trade-off was sustained performance. Short or bursty workloads would let the full turbo be used, giving great short term performance, but over time the Surface Pro 3 would throttle back compared to Surface Pro 2. Microsoft has addressed this in the Surface Pro 4 in two ways. First, they have moved from the 22nm Haswell based Core i3, i5, and i7 to Intel’s latest and greatest 14nm Skylake processors, bypassing Broadwell in the process. 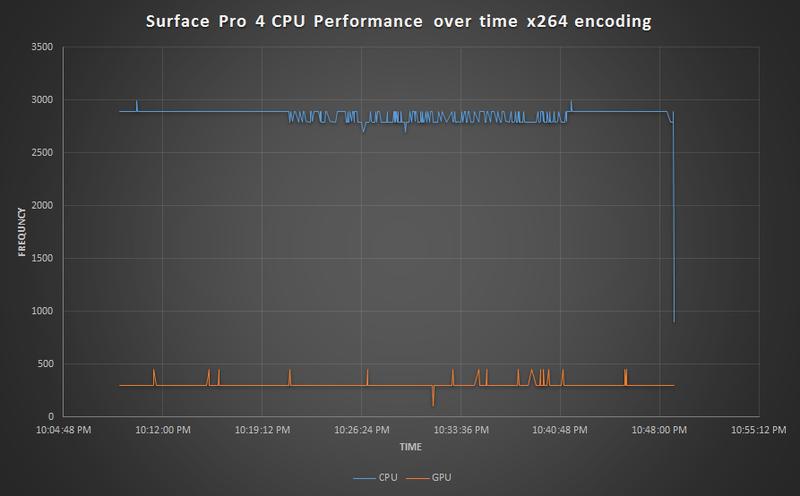 Surface Pro 4's CPUs are still rated at up to 15 Watts though, so despite being able to do more work in the same amount of power, you still need to dissipate the heat in order to maintain performance. Microsoft has moved to what they are calling a hybrid cooling system in an attempt to do just that. When they say hybrid cooling, it has nothing to do with a Toyota Prius. Instead, the Surface Pro 4 now features two cooling systems. There are two heatpipes coming from the CPU, with the first one leading to a large copper plate which is housed between the battery and the display. This block of copper is designed to be used as a passive heatsink, better spreading the heat from the CPU across the entire chassis as opposed to keeping it in the corner. Surface Pro 4's passive cooling is meant to be used for most tasks, which should help out with the fan noise that was present on the Surface Pro 3. 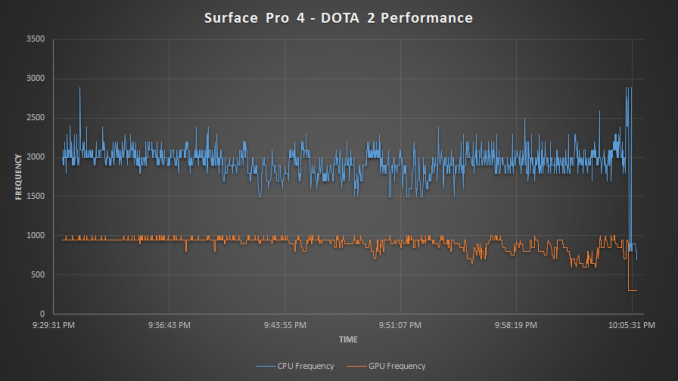 So far I've found that Surface Pro 4 stays passive for almost all tasks, and I’ve only noticed the fan kicking in under gaming or heavy benchmarks. Otherwise once the heat output exceeds what can be removed through the passive cooler, the active cooling component kicks in. Turning on its fan, the Surface draws heat from the CPU via the second heatpipe and expels hot air out the small slots up by the power button. This is slightly different from a traditional active cooling setup - the "heatsink" isn't used as part of the active cooling system - and as a result this setup allows the Surface to augment its passive cooling with the active cooling supplied by the fan. The one exception to all of this is the Core m3 version of Surface Pro 3. At just a 4.5 Watt TDP, the active cooling is not required and the fan is not even installed in that model. At the launch event for the Surface Pro 4, I was told that the new cooling system can actually dissipate more than 15 Watts, so if that is the case the Surface Pro 4 should not run into the same throttling issues that were prevalent in the Surface Pro 3. To take a look at the new changes and how they affect performance, I’ve run some tests to see if we can come to a conclusion on whether or not this is going to be an improvement over the Surface Pro 3 despite it actually being a bit thinner. First, let’s take a look at the same workload Anand used in the Surface Pro 3 review. PCMark 8’s Work test is a nice mix of workloads with some that are very CPU intensive and some are burst tasks. Anand found that even on this test where the CPU does have a chance to clock down between tests, there was still a drop of up to 8% running the tests sequentially. Each time you run the test, it runs through the same workloads three times, so by running the entire test three times we are running nine sets of tests in a row. The first thing that is obvious is the better performance of the Surface Pro 4, but also the consistency between runs is much better. There is no evidence of throttling occurring with the new model. 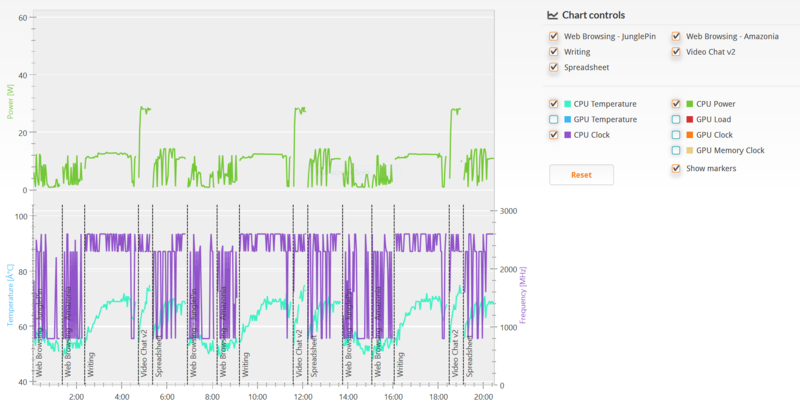 PCMark also keeps track of CPU frequencies and other stats during the run. There is no way to export this other than to use their graph so I’ve copied the image here. I’ve also included the images used with the Surface Pro 3 review for comparison. Do note however that PCMark 8 can't currently measure Skylake power usage, so we aren't able to record that for Surface Pro 4 at this time. It’s a bit tough to see because PCMark auto-scales each graph individually, but the Surface Pro 4 performs much better than the Surface Pro 3. The biggest difference is that the temperature of the CPU is much lower. The Surface Pro 3 approached 80 degrees Celcius, but the Surface Pro 4’s Skylake processor doesn’t even hit 60 degrees in this test. Part of this is the new 14 nm processor but the new cooling system is also doing a nice job. I think PCMark is a good test of normal workloads, but it’s not going to be something that really stresses the CPU for a long time to see if the chip will throttle over sustained workloads. I’ve also run logging while doing a run of the x264 benchmark which puts the CPU at 100% load for the duration. This is a pretty good result. The CPU is basically pushed to 100% for the entire run and although there are some frequency changes, over time we do not see a drop in performance which you would see if the processor was running into a temperature limit. Once again part of this is Skylake, which is going to be more efficient than Haswell, but it still has the same 15 Watts of thermal design power and this is a great showing by the Surface Pro 4. However if we really want to stress the chip to the max while doing a task that is actually a real world test (and not just a CPU/GPU stress test which is not real world at all) we can turn to gaming. GPU workloads can easily chew through all of the available power/thermal limit. 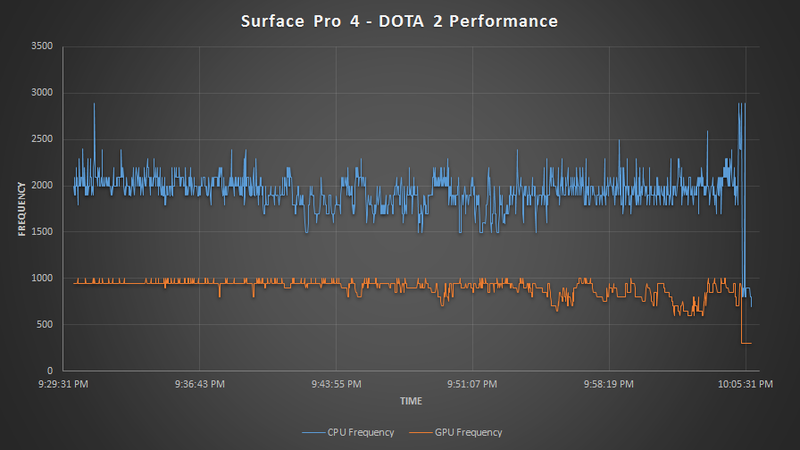 To test this, we are using a new version of our DOTA 2 benchmark for the recently launched DOTA 2 Reborn. This test was performed with our Enthusiast settings which is 1920x1080 and all settings set to max. The Surface Pro 4 does pretty well here again, but now we can finally see the thermal limits of the thin chassis. Eventually, the GPU has to be clocked down in order to keep temperatures in check. Overall the outside design of the Surface Pro 4 has not changed much. It’s slightly thinner, slightly lighter, but unless you had it side by side with the Surface Pro 3 it would be difficult to tell the difference. The real changes are under the covers, where the new cooling system shows that you can actually build a thin tablet with a Core CPU inside.